Hello folks! Today, I’m writing this post to talk about a solution we found to the following problem: how do you export compliance data from a Rudder installation? Well, okay, but Rudder only seems to provide a graphical display and (with a plugin) a PDF summary… what can I do ? What do we need exactly ? What do we have to achieve it ? How do we implement it ? 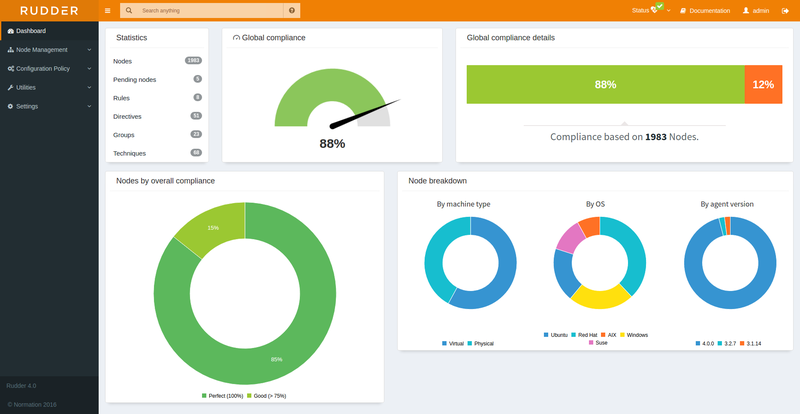 The first part is a business need: Rudder compliance data is crucial for enterprise users that need KPI’s on their infrastructure health. Problem is, that exposing this kind of KPI’s can be done in multiple ways: Rudder by default exposes them in the Web UI as components like the main dashboard and context-specific representations (Rules view, Nodes view …). We need a way to obtain “raw” metrics in a format that can be used in a wide range of applications. Fortunately, Rudder’s REST API has methods for this! Rudder’s API’s role is to expose all the data it has (compliance, rules, directives, settings…) using a standard REST interface, that enables a user or developer to query various things without having to scrape the Web UI. Cool, how can I use it? You then need to edit the script rudder-compliance to set the Rudder URL and API password in the “Configuration” area. Just take a look at the rudder-tools repository to discover all of the utilities!